This year I’ve made it my aim to visit and review all 13 of the restaurants located in the newly revamped Corn Exchange in Manchester. 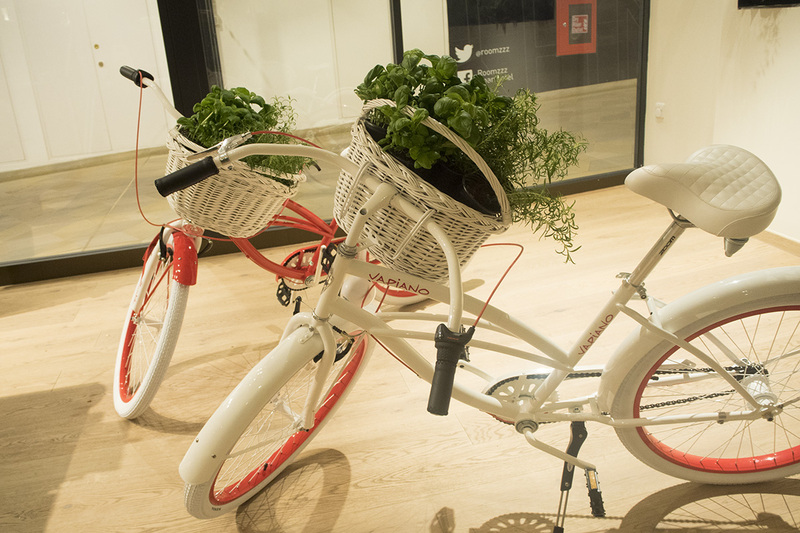 It used to be home to a few average shops that nobody really visited but now it’s been transformed into a huge haven for foodies. 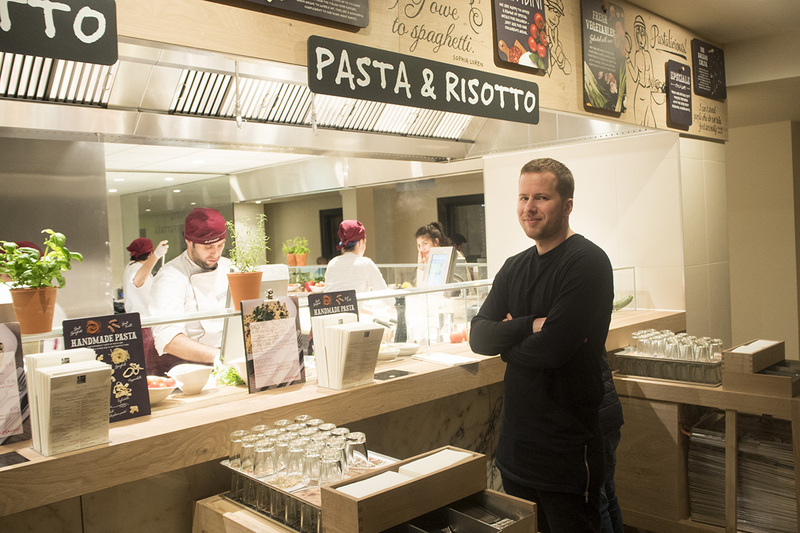 One of the additions to the Corn Exchange, and also to Manchester full stop, is Vapiano. I’d already heard and seen a lot of good things about its London restaurants, so I was really keen to get in there and try the food for myself. Once you enter the huge restaurant, which I believe is the biggest unit in the Corn Exchange, you’re greeted by a reception desk where each diner collects their card for the meal. It’s pre-loaded with £50, which you present when ordering food/drink, and you settle your bill at the reception desk before leaving. 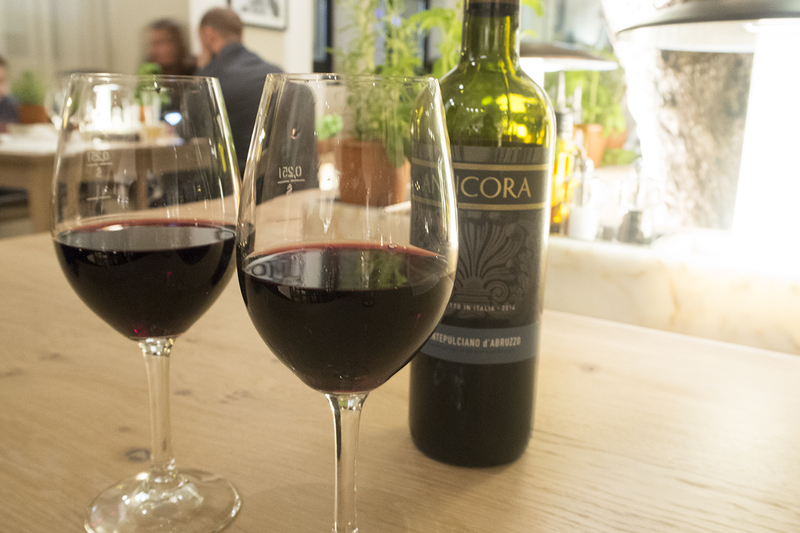 When we’d wrapped our heads around the system, which is pretty alien to the Manchester restaurant scene, we grabbed a bottle of red from the bar and went on the hunt for the perfect spot to spend our evening. Vapiano doesn’t take bookings, but even on a busy Saturday night we saw plenty of free tables in the restaurant. 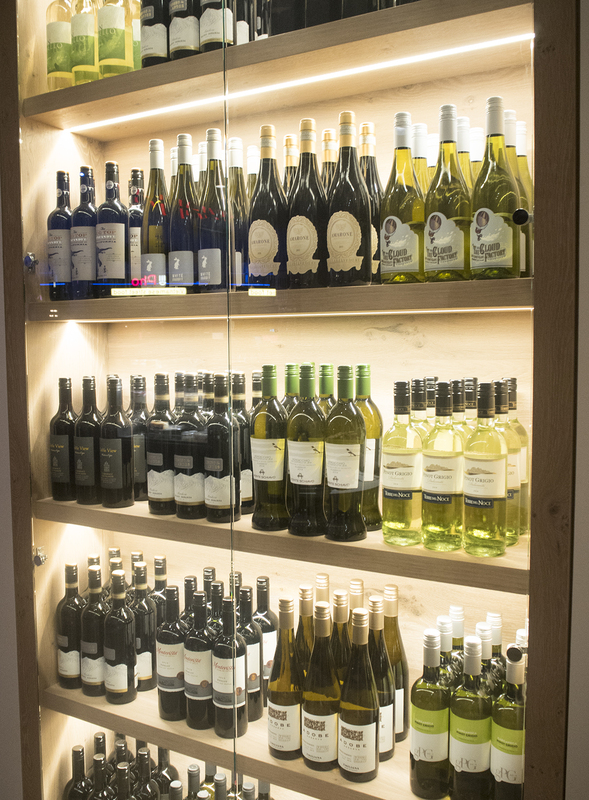 It occupies two floors so you’ll probably be spoilt for choice! 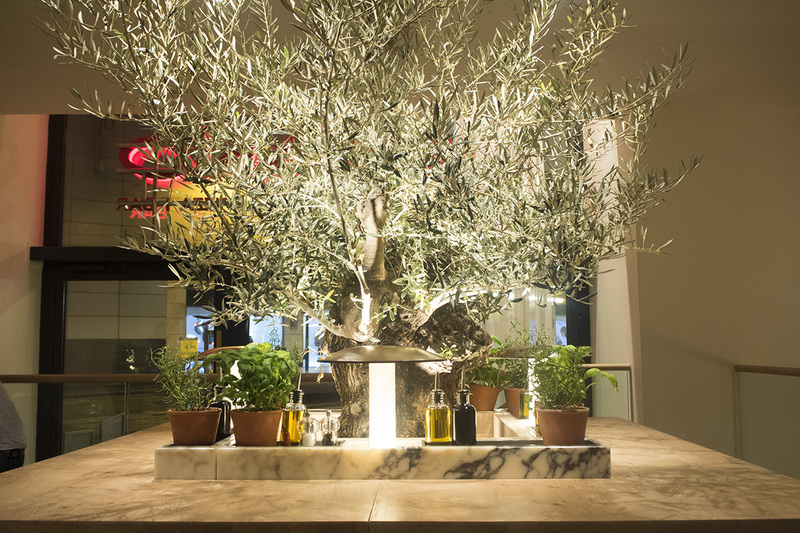 Our choice was around one of the huge olive trees that sit in the centre of a number of tables in the restaurant. 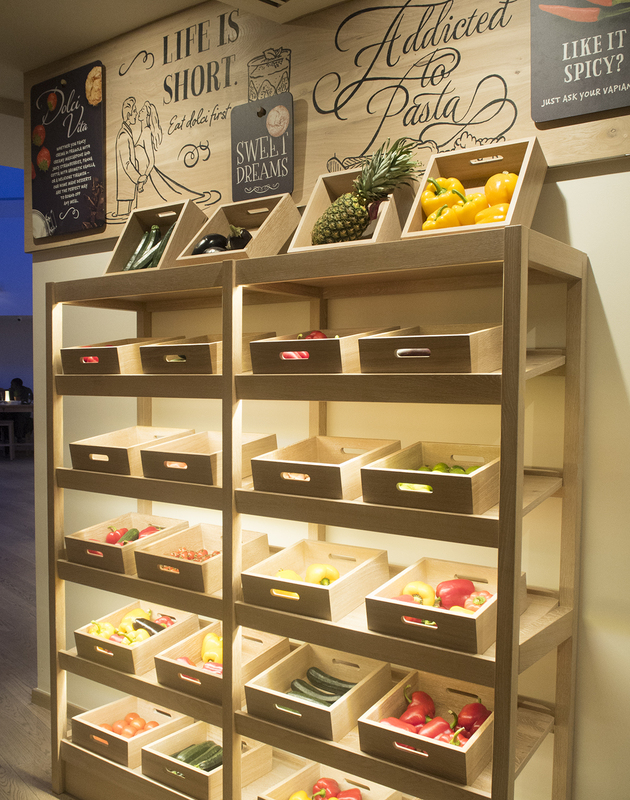 There’s plenty of emphasis on freshness in Vapiano, with fresh fruit, vegetables and herbs dotted around the restaurant, and this extends to ordering food too. Everything is ordered from a designated food station, where each dish is made-to-order and prepared right in front of you. 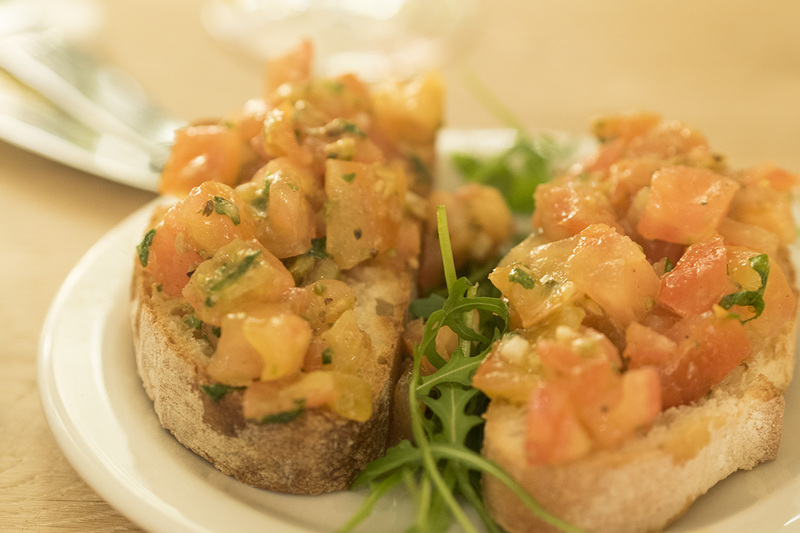 We opted for some antipasti to kick things off, choosing the Carpaccio (£9.95) and Bruschetta (£3.50) as we both love to share our starters. 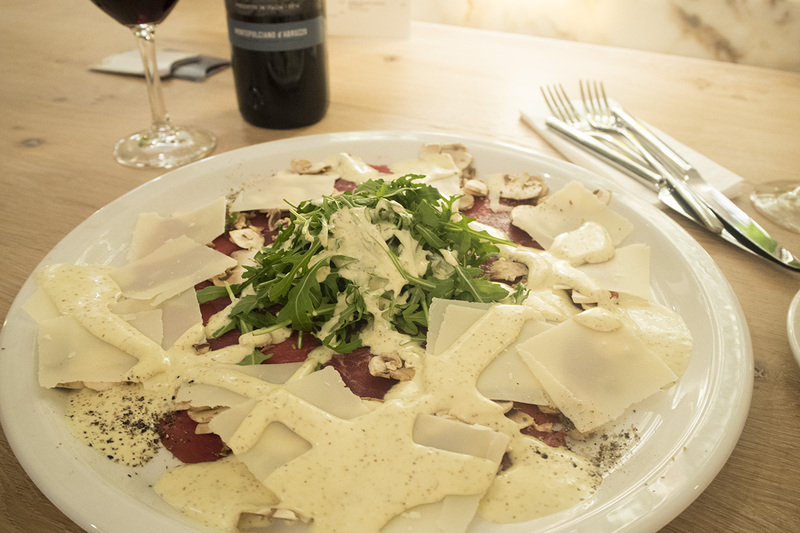 The Carpaccio is a huge plate of finely sliced beef fillet, cipriani sauce, rocket and Grana Padano D.O.P (a semi hard cheese). The beef was tender and flavoursome and complemented the cheese really well, although I think there was just a little too much sauce on there. 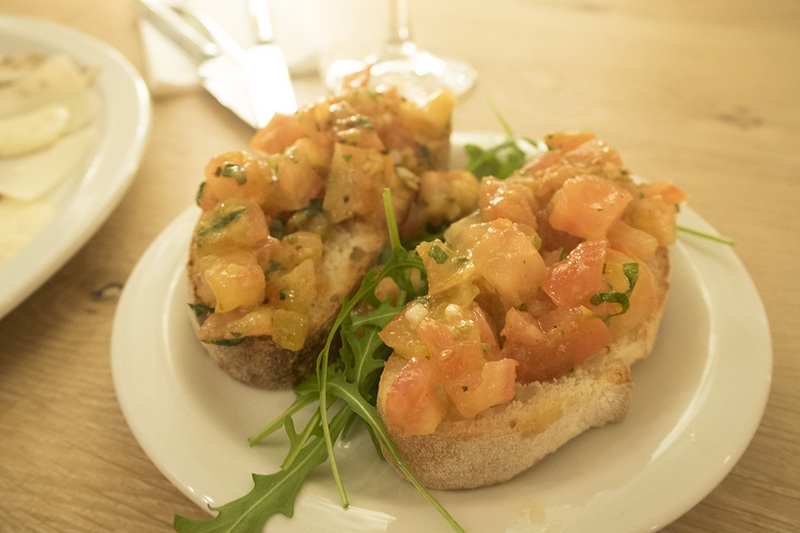 The Bruschetta was as lovely as you would expect, with juicy tomatoes, a good kick of garlic and herbs, drizzled in olive oil and all rested on crunchy homemade bruschetta. Let’s be honest, when you’re dining at an Italian restaurant there’s really only one difficult choice to make: pizza or pasta? We were both really feeling a bit of pasta this time, so we headed over to the designated pasta & risotto station to have our dishes prepared. Salsiccia Con Fichi (£10.25) was Mat’s dish of choice, with spicy Italian sausage, onions, tomato sauce and fresh figs. Although he was a bit skeptical of the figs, he actually ended up loving the combination, especially the kick of spiciness that the Italian sausage gave the dish. If I visit an Italian restaurant (or just every kind of restaurant), I’m always drawn to the fishy dishes, so obviously I opted for the Salmone pasta dish (£10.25). Flaky salmon fillet, cherry tomatoes and rocket in a creamy white wine sauce, it was really tasty and right up my street! My only issue was the crazily strong peppery taste of the rocket, which overpowered some of the flavour. 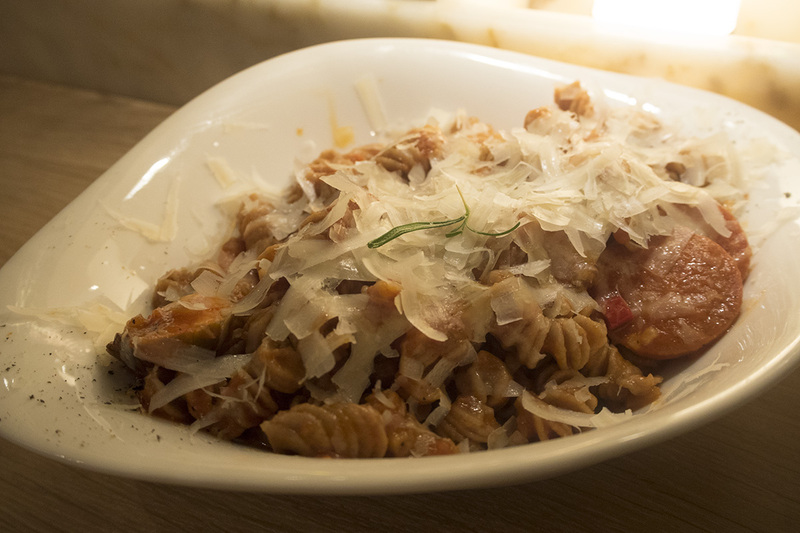 Oh and the best bit of our pasta dishes? You can choose the type of pasta you want and we were able to have spelt pasta, which we both prefer. It makes for a much healthier meal too… if you ignore the extra parmesan we had on top! 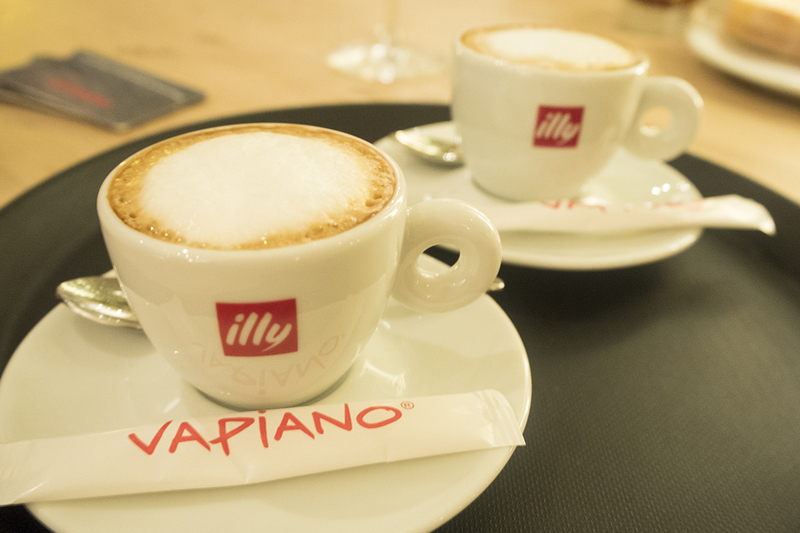 Finish off with an Illy coffee or perhaps a bit of dessert if you’re not in too much of a carb coma! I’m a massive tiramisu fan and the one here looked delicious. 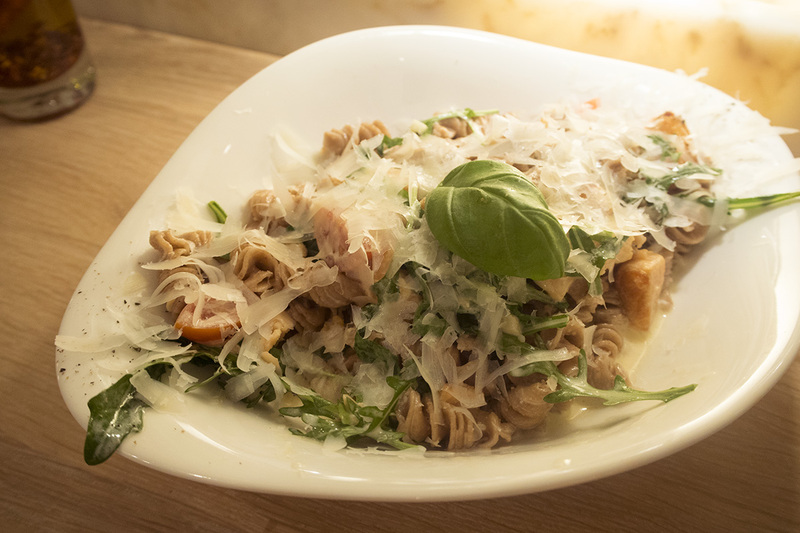 So what did I actually think of my first ever Vapiano experience? Honestly, I loved the food and appreciated the emphasis on tailor making your perfect dish and having it made freshly. From a personal point of view, the only negative for me was the self-service aspect. I found it a bit awkward having to leave our table and mentally debating whether to take my bag with me or not each time we wanted to get another course. It’s probably a pretty neat concept for those dining in a group, but for a couple it’s a bit tedious having to wait for your food and/or wait for your date to arrive back at your table. I’m definitely more of a table service kind of gal! That being said, the food is well-priced and the portions are generous, making it a great little spot for a lunch or dinner date with your work pals or besties. Disclaimer: Our meal for two was complimentary of Vapiano but as always, all thoughts & opinions are my very own. 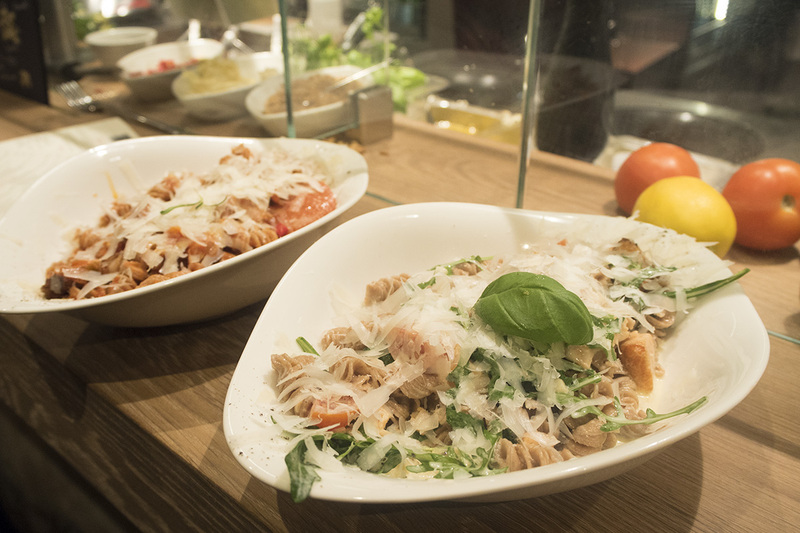 Have you ever visited Vapiano? How did you find the experience?